This chromolithograph is taken from plate 2 of William Simpson's 'India: Ancient and Modern'. Europeans prized cashmere shawls for the softness and warmth of the wool, the rich colours, the intricacy of the weave and designs. They were hand-made by men from fine 'pashm' wool, which was taken from the downy underfur of a Himalayan mountain goat (Capra hircus) and brought into India from Tibet and Ladakh in the summer season. 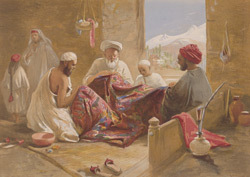 From the 15th century, successive rulers of Kashmir, including the Mughals, continued the evolution of the shawl. Europeans then began to extend its popularity. The French sent patterns to agent's houses in Srinagar to be made up in Kashmir, based on general orientalist designs. The British largely preferred local designs: Lady Canning asked for traditional patterns in her order of 1861. One traditional design was the 'Char bagh ka namuna' or Pattern of the Four Gardens, made up of four separate pieces of differently coloured cloth.